That was the theme of this video that was launched on Sunday and shown before David Cameron spoke to the Cheltenham Spring Forum. The words are slightly hard to read on the small screen until 40 seconds in but are large enough after then. It's a reworking of this video from October 2007. David Cameron talks to ITV viewers about the loss of his son, Ivan. 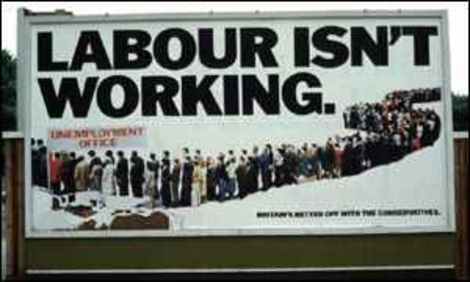 What is the 2009 equivalent of Labour isn't working? The Conservatives will win an early election if they can convince the British people that Labour's borrowing is irresponsible. Although speeches, telephone number statistics and op-eds are essential parts of the persuasion process the most decisive political victories have also been associated with iconic images that resonate with the public. How can you be a journalist and a politician and still be loved? It's hard to watch this Clarkson meets Boris video and not think that the Mayor of London is something of a political superstar. You can't lift yourselves out of recession with short term stimuli or with high taxes. That was one of the messages that John Major communicated in this nine minute broadcast from 1992 (when Britain was last in recession). We see the former Tory leader (now enjoying a measure of rehabilitation) tour Brixton - where he grew up - and he talks about his love of the House of Commons, about multiracial Britain, his Citizen's Charter, the NHS and schooling. As with 1992's tax bombshell PPB, we are grateful to the Conservative Party's Archive for allowing us to republish this broadcast. After eight minutes the video climaxes with some memorable blasts of Purcell. John Major's 1992 tax bombshell broadcast was one of the most successful of modern times and helped propel the Conservatives to an unexpected victory over Neil Kinnock. 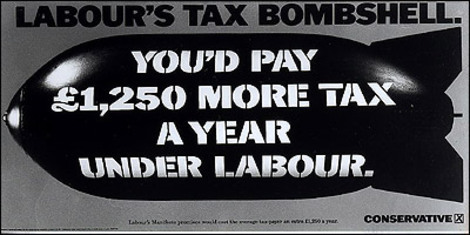 Most political enthusiasts still remember the 'bombshell' part of this broadcast but most of the five minutes was taken up by a look at the implications for homemakers and workers of Labour's '£1,000 tax bombshell'. Watching it again I am struck by just how accurate the video has turned out to be. I am very grateful to the Conservative Party Archive for allowing us to publish this broadcast which hasn't been on YouTube until today. Tomorrow we'll be publishing the famous 'John Major, the movie' broadcast from the same year. Please fill in THIS SURVEY if you would like to help make future videos. PS I was a bit ambitious to promise eight conclusion posts today (I'll do the other four tomorrow!). More here. Jonathan is soon going to be editing ConHome, hopefully by the end of October. Poor Gordon. Today was his big relaunch but what does the main evening BBC news bulletin lead with? Mervyn King's warning that the road ahead - on economic growth, inflation and house prices - is going to be rocky. Mervyn is right, of course. Headcases broadcasts on Sunday at 10pm on ITV1. The video beat the Conservatives Abroad website and its targeting of ex-pat voters and the Tax Pacman game launched by the Conservatives at last year's Party Conference. More than 8,000 people took part in the vote to choose between the shortlisted entries in each category. We've been announcing winners on an almost daily basis. Yesterday's winner of the internationalist award was Ben Rogers of the Conservative Party's Human Rights Commission. George Osborne's video response to what he's calling Labour's Bad News Budget. Earlier this week Iain Dale chose not to join blogs like ConservativeHome in criticising Derek Conway. That was an honourable decision because, as Iain said at the time, he is a friend of Derek Conway and "Anything I have to say about his conduct, I will say to his face." In the 'Heffer confronted' video above Iain's position has migrated and he's now defending Derek Conway - dismissing the thrust of the disgraced MP's errors as "administrative". Iain must be one of the few people in the country who do not believe that Mr Conway's errors are much more serious than that. One MP told ConservativeHome (rather too colourfully) that Derek Conway was like a suicide bomber in the midst of the parliamentary Conservative Party. He hadn't only wrecked his own career but had badly contaminated the reputation of all Tory MPs and had gifted Gordon Brown his biggest break since Bottler Saturday. Iain Dale is a great blogger but Simon Heffer gets the better of him in the exchange above. This ten minute video emphasises the progressive character of conservatism. It takes us right up to present day's Cameron-led party and the Built to Last values statement. Thanks to Louise Bagshawe for alerting us to it. Radio 4's World This Weekend briefly mentioned this video. Mitt Romney is left looking evasive and perhaps even rude after being asked if he'll arrest a wheelchair-bound man for using 'medical marijuana'. Although the issue may be real it was clearly a set-up. At the end of the interview the man videoing the encounter pursues the wheelchair guy's line of questioning. We can only hope David Cameron is prepared for similar ambushes. We guess someone, somewhere is planning something for Mr Brown. This is the era we now live in. This editing together of Fred Thompson's umm-ing and err-ing is just the latest in a series of YouTube videos that are mercilessly magnifying American candidates' personal traits. The nervous laugh of 'Rudy Giggliani' and, much more amusingly, Hillary Clinton's mechanical laugh have also been targeted. For the funniest ever political videos visit the comedy section of PlayPolitical. With apologies to our younger readers but can you believe it? It's been seventeen years since Margaret Thatcher won the support of 204 MPs and Michael Heseltine won 152 votes. In many ways it seems like yesterday to me. The 52 majority wasn't enough to end the attempt to oust her and a few days later Margaret Thatcher resigned. Watch the BBC News report her resignation here but the video below records John Sergeant's reflections on the Iron Lady - including that famous Paris scene where she reacts to her failure to win the first ballot decisively. ...is PlayPolitical. The Daily Mail's Political Editor wrote about this very briefly on Friday. Thanks Ben! PlayPolitical.com is part of the ConservativeHome family of websites. It aims to host the best political videos from around the world. Most videos tend to be American but, over the last few weeks, we've been following Australia's elections closely and you can watch the latest Liberal and Labor ads here. Sam Coates and I aim to add new videos everyday. Today there's a two minute 'Who would Jesus vote for?' ad and a five minute recording of Mitt Romney's defence of his Mormon faith. And if you want to see our favourite political videos of all time please visit PlayPolitical's Hall of Fame. It includes Ronald Reagan's Morning in America ad, John Redwood 'singing' the Welsh national anthem, Gordon Brown picking his nose at PMQs, the hilarious JibJab Kerry Vs Bush video from the 2004 campaign, the SwiftBoats ad, Child's Pay - a clever attack on Bush's borrowing, and A World Without America. Watch them all here. And please add PlayPolitical.com to your favourites!